"Jimmy Olsen's Big Week: Day Three"
"The Black Ring: Part Six"
Vandal Savage watches for Lex Luthor from Bohemia in the 1300s. He observes his trap-laden fortress in which he's hidden the black power, and notes its traps. He also reveals that he's been told through prophecy that Luthor will bring him happiness somehow, related to the black power. Time passes, until the present day. 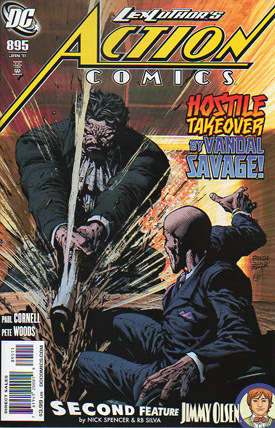 We see Vandal Savage encounter Lex Luthor in many situations (including Salvation Run). In the process, he instructs his daughter Scandal not to tell Luthor of his future. Meanwhile, Luthor awakens next to Lois and realizes somehow instinctively that if he changes the spheres, he will be given power. He opts to change two of them from orbit, and in doing so, he draws the ire of Vandal Savage (who sees his fortress waylaid). Vandal takes Luthor's board hostage and threatens Luthor, saying that if Luthor doesn't accede to his wishes and bring him his happiness, he will blow up the Lexcorp tower. Meanwhile, Scandal Savage and members of the Secret Six watch, wondering what they should do. Story - 4: Unlike the usual Cornell so far, this issue is slightly indulgent and a little off task, but sometimes it swings back and kicks at what's been great about the series so far. Vandal is the high point, with the novelty of his character played very well, so much so that even where the plot is indulgent, it's creative, such as when the goons turn on each other, or when Vandal is being cruel to his town. The black power thing is a bit odd, and I don't understand the properties, so it's a bit frustrating to see it focused on so much, but given that it's the object of desire, it can't really be avoided. My greatest joy here has been the character, however, and that still sticks out and shines. It's a fairly regular issue, and one without too much craziness, so I can't really go off on it, and that's kind of a relief, given that this is my last regular review for the Superman Homepage. In case you don't watch the Speeding Bulletin, I've announced that I'm leaving the site for a while. Not because of any animosity between any members of the site or its staff, not because I hate Superman, not because of anything folks have asked about, really. The answer is simple... if I can't be passionate, I do you all and myself a disservice. The reason I am not passionate is not distaste for the character. I can say that I was rocked into this decision by the catalyst of JMS casually leaving Superman and acting as though it were a great success on his part (particularly given the theme and tone of Earth One), but it was that, plus about fifteen other similar actions on the part of creative folk, editorial, and just general stewardship of the character that made me want to pull back a bit. I went from being lividly angry to a position where I realize that it doesn't matter how right or wrong I am about the direction of the character, they're gonna do what they're gonna do, and that direction seems to be going in a way I'm not fond of currently. I can't be passionate about that, however, just numb, so it doesn't befit me to commentate. Beyond that, increasingly I have found myself throwing my passion into new things. In the last two years I've produced four novels, and I'm jumping headlong into an ongoing, weekly digital comic called Cura Te Ipsum, which you can find at www.charlieeverett.com. I'll still be around the Homepage, more as a fan than a contributor, and you will likely see me commentate on a few things now and again, like the upcoming movie (I don't think I'll be able to resist a review), but for now I'm handing off Radio KAL and Bailey Planet. We're still figuring out the details, but videos are recorded through December. This is article number 875 I've written. I still feel like I just started this gig. Then I look back and see the numbers on those first reviews. The first one I ever did was Realworlds: JLA, back in June of 2000, and I look back on that and I cringe at my own prose. That's good. Means I've progressed, which I dig. The first Action Comics issue I reviewed was #771. I can't believe it's been over a hundred issues. That's just nuts to me. I'm having trouble believing Emperor Joker was that long ago. At any rate, I go into the nostalgia of the thing in my Bailey Planet videos, but I figured I'd drop a mention here and sound like "Old Man Bailey" one more time, because I want to thank you all for reading all these years, and for your continued faith, passion, and kind words about my work. I hope you'll keep following me as I move along, but if you don't, it's been my absolute pleasure. Art - 4: Woods maintains his usual standard of work, which is above average, but no panels stuck out at me and stayed with me, alas. Still, better than average work, as is typical. Jimmy Olsen takes the aliens around town, showing them how boring Metropolis is in an attempt to make them not want to party there. He succeeds, with the help of Supergirl, Perry White, and some carefully placed billboards. Chloe stays broken up with Jimmy, and Lois comes to Jimmy to help him find a new girlfriend. Story - 1: This suffers from the same pitfalls and failures of the last two parts. Large blocks of text that aren't extraordinarily compelling, the reduction of Chloe to a side character in a cheesy Jimmy Olsen story when it's supposed to be her introduction, a villain that doesn't really entertain and has been done a thousand times before, and hey, just for a cherry, let's make Martha seem like a dolt. Art - 4: The art was actually pretty optimistic and cool. I dug it for what it was. Pretty awesome Supergirl, to be honest, even if Chloe isn't particularly as I'd prefer her rendered (she looks plain mean most of the time). Cover Art - 3: A bit dark, obscuring what's going on. Still, the action is very bold, but when you couple it with how rough hewn it is, it makes it a fairly average cover.